Located in North Devon Biosphere Reserve is the Treetops guest house. Built in a 250-year-old oak tree is this two bedroom three house. 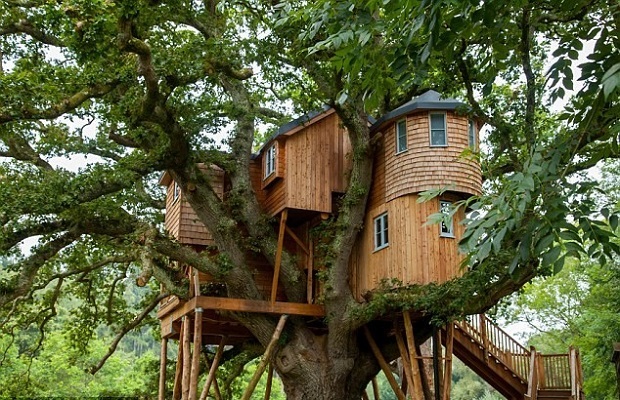 The Treetops takes tree house to another level, glamping at another level. This vast tree-home runs over three floors, with the tree passing under, over, around and even through it; there is one particular branch in the lounge having been cunningly covered with a box seat. With designer stores a plenty, vintage boutiques, fantastic food, art and grand architecture, Milan is the perfect place to enjoy a stylish weekend away. Start your trip by checking into the Bulgari Milano Hotel, which many of the city's visitors are happy to call home during the Milan Fashion Week (September).